This picture comes from Stephanie West. This is just an odd picture of us. It was taken at the 2006 DCI Classic Countdown in San Antonio. All of us in the picture were members of Revolution. 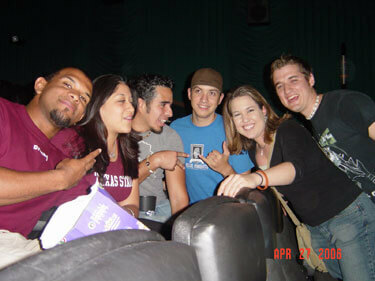 From left to right: Arnold "Chuck", Clarissa, Justin, Dave, Stephanie (me) and Brandon. We weren't sure if the picture was captured, and it was.